If you are considering owning your own business, it’s important to make sure that there is a market for the products and services your business will offer. Because refinishing is a service that nearly every home, hotel, and apartment could use and benefit from, it makes great sense to consider owning a Miracle Method franchise. As a matter of fact, any property with a bath or kitchen is a potential prospect for refinishing services. 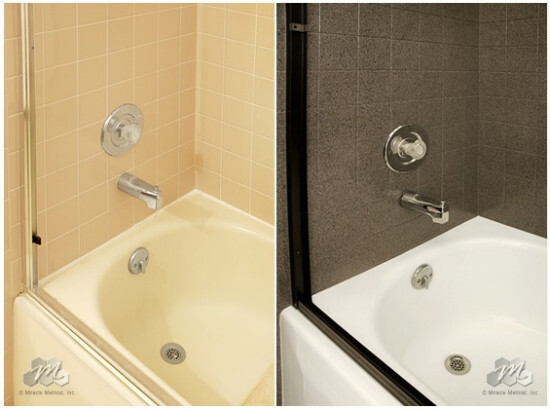 Miracle Method’s surface refinishing process can restore all kinds of bathtubs; ceramic tile walls, showers, vanities, and even kitchen countertops to a like-new look and feel. Plus chips, scratches, and cracks can all be repaired, giving most fixtures around an additional 15 years or more of usable life! When you think of all of the homes, hotels, and apartments with kitchens or baths in need of a restored surface or an updated look, you can really begin to see the potential a Miracle Method franchise has. Minimized risk – Working with a reputable franchise with a proven business model. Name recognition – A well-recognized brand name will draw in customers who feel confident in working with a national franchise vs. an independent with no national support or accountability. Training – Miracle Method provides a regimented training program that teaches franchisees about its services and business operations. Advertising – Professionally designed ad campaigns to promote your business both locally and nationally. If owning a Miracle Method franchise sounds like the business for you, visit our website for more information, or give us a call at 800-444-8827. We’d love to help you get started in owning a successful Miracle Method franchise. Miracle Method will give you all the support you need to run a successful franchise. In times of uncertainty, it makes sense to take control of your own future and managing your own business could be the answer. However, you’ll want to make sure that you do it with a network that can support you and also have business that has competitive and strong demand for its products and services. Owning a Miracle Method franchise could be exactly the opportunity you are looking for. When you run your own Miracle Method franchise, you are in business for yourself, but not by yourself. Our team will train you on all aspects of owning a Miracle Method franchise. And our National Office is always available to support and assist new owners with their questions, and you can always access other franchise owners through our online forum, which is a great place to ask questions and learn what’s happening in other markets around the country. You’ll have a wonderful network of team members who will give you all the support you need to get started and develop a successful business. Great business opportunities always exist for savvy entrepreneurs and surface refinishing is one of those businesses. Because refinishing offers a solid value to homeowners as well as commercial property managers, this industry is experiencing significant growth. Replacing tubs, showers, tile walls, vanities, sinks, and countertops can be costly and time consuming, but refinishing offers a great value compared to replacement. The Miracle Method refinishing process effectively recycles fixtures by extending the life of the surface for up to 15 to 20 years or more. Refinishing has never been more popular than right now as consumers are interested in upgrading their baths and kitchens, but even more interested in saving money. Now is a great time to invest in your future by opening a Miracle Method franchise. To learn more about owning your own franchise, visit our website or call 800-444-8827.